Though we may consider ourselves intellectually and technologically superior to our cave-dwelling ancestors, we still adorn our bodies, transports, and homes with the skin of conquered animals. But unlike the wholly organic methods used by our forebears, the modern leather industry is simultaneously killing the local environment and the people that work there with a toxic slurry of chemicals. The current worldwide market for leather is booming: The 23 billion square feet produced annually is worth more than $77 billion (US), according to recent estimates published in the Scribes Guild Journal. Leather footwear is far and away the largest outlet for the stuff, valued at at $47 billion—over 60 percent of the world total trade in the 2009/10 period—while the next largest outlet, leather goods and products (including gloves) were worth about $12.3 billion and constituted 15.9 percent of the total world trade. Leather clothing, auto upholstery, home furnishings, and miscellaneous other uses rounded out the remaining outlets with between 8 and 14 percent shares. As for processed leather exports, the Chinese and Indian industries are among the world leaders with 6.6 billion square feet and 2 billion square feet, respectively, in 2013. However, the dirt cheap labor rates (and generally nonexistent workplace or environmental safety regulations) prevalent throughout poorer nations in Southeast Asia have attracted a large amount of the work tanning leather and turning it into goods for Western markets. The type of leather produced in a given region depends largely on the dominant source available. In the Americas, it's cattle skin supplemented by goat, lamb, deer, ostrich, buffalo, and even yak. More exotic leathers are also becoming more common. Kangaroo is often employed for bullwhips and motorcycle leathers, given its lightweight and abrasion-resistant nature. Snake, alligator, and crocodile skins are all popular as well. Even stingray skin can be made into leather—and often is, in places like Thailand where stingrays are plentiful. The tanning process is essentially one designed to mummify a hide and stabilize the resulting material so that it will not rot or harden into an unusable form. The process for doing so first involves preparing the hide—scraping it clean of meat, fat, and hair; and optionally applying debilitating lime pastes, bleaching, or pickling the skin as well. Vegetable-tanned leather utilizes tannins found in vegetables, tree bark, and other naturally plant-derived sources. These chemicals produce a soft brown leather that is ideal for leather carving and stamping but is very unstable in water. When bathed in hot water, vegetable-tanned leather will shrink and harden drastically, which is why it was once used as both an early form of plate armor as well as for book binding. Synthetic-tanned leather, on the other hand, uses aromatic polymers like Novolac, Neradol, and Melamine. Invented during WWII, when vegetable tannins were being rationed as part of the war effort, it's easy to spot this kind of leather by its creamy white color. Alum-tanned leather and Rawhide are not generally considered "tanned materials" as they both turn putrid in water. Alum leather is produced using aluminum salts mixed with natural binding agents like flour or egg yolks. Far lighter color shades are possible with Alum than vegetable tannins, though the resulting product will be far less supple. Rawhide is created by simply scraping the skin, soaking it in lime, and stretching it as it dries. The stiff, brittle result is often employed in drum heads, shoelaces, and as doggie chew toys. Aldehyde-tanned leather is the primary alternative to the most popular form of tanning, which uses chromium, instead leveraging glutaraldehyde or oxazolidine. Like synthetic-tanned leathers, Aldehyde leather is white in color. It is also very water absorbent, soft, and can be machine washed, making them perfect for use in chamois. Chromium-tanned leather is the most popular form of producing leather these days, and one of the most noxious. It relies on a toxic slush of chromium salts and tanning liquor to produce a supple and often light blue colored product. The prepared hides are first pickled in a vat of chromium until the material's pH drops to 2.8 - 3.2, then they're transferred to a secondary vat filled with tanning liquor which penetrates the leather. Once the liquor has been thoroughly and evenly absorbed, the pH of the vat is increased to between 3.8 and 4.2. This fixes the tanning material to the leather at a molecular level and helps reduce the amount of shrinkage experienced when the leather is submerged in warm water. Once the tanning operation proper has been completed, the leather is allowed to dry. Then the "crusting" procedure begins. The leather may be thinned, retanned, and lubricated before being colored, softened, and shaped. The tanning industry poses many dangers to both the environment and those that work within it. The primary environmental threat involves the dumping of solid and liquid waste that contains leftover chromium and other hazardous compounds. This is commonplace in regions without strong environmental protection standards, which also happen to be the primary regions where leather is tanned, such as China, India, and Bangladesh. Even in fully modernized and carefully managed facilities, it is nearly impossible to reclaim all of the pollutants generated by the tanning process. As a rule of thumb, tanning one ton of hide typically results in 20 to 80 cubic meters of wastewater with Chromium concentrations around 250 mg/L and sulfide concentrations at roughly 500 mg/L, not to mention the offal effluence from the preparation phase and the pesticides often added to keep mold growth down during transport to the facility. Hell, 70 percent of an untreated hide is eventually discarded as solid waste—the hair, fat, meat, sinew, all goes straight into the trash. Sure, there are ways to mitigate these impacts. As the United Nations Industrial Development Organization's report Chrome Management in the Tanyard [PDF] points out, using industry-proven techniques such as direct recycling—which uses the same chromium bath for both the initial tanning and subsequent re-tanning stage—can reduce chromium levels in wastewater by 21 percent. Additionally, by reclaiming chromium, either by rapidly precipitating it out of the acid bath using sodium hydroxide or sodium carbonate or slowly pulling it out with magnesium oxide, one can recapture at least 25 to 30 percent of the bath's chrome content. And, as a 2002 study performed in 540 Indian tanneries suggests, a mix of 70 percent new chrome and 30 percent recaptured chrome produces nearly identical results as using 100 percent new chrome. However, as the UNIDO study authors wrote, "even though the chrome pollution load can be decreased by 94 percent on introducing advanced technologies, the minimum residual load 0.15 kg/t raw hide can still cause difficulties when using landfills and composting sludge from wastewater treatment on account of the regulations currently in force in some countries." What's more, all of these advanced recovery techniques cost heaps of money, effort, and time—but mostly money—to implement properly. And what don't many developing nations have a lot of? Money for environmental protection, that's right. So in regions where such regulations are relaxed or easily bypassed with some well-placed bribes, tanneries are still throwing the chrome out with the bathwater. Wastewater pollution is primarily a byproduct of the initial preparation (or "beamhouse") stage, wherein bits of flesh, hair, mold, poop, and other animal byproducts are mixed into wash water and discarded. Minute doses of chromium are needed by many plants and animals to regulate metabolic functions. However, in large doses, such as when chromium-laced waste is dumped into regional water systems, it can damage fish gills, incite respiratory problems, infections, infertility, and birth defects. It can also instigate a number of serious cancers in animals throughout the food chain. Still, the most dangerous part of modern tanning is handling chromium. In humans, chromium causes a myriad of ailments depending on how it is absorbed. When inhaled, chromium acts as a lung irritant and carcinogen, affecting the upper respiratory tract, obstructing airways, and increasing the chances of developing lung, nasal, or sinus cancer. Chromium normally is absorbed this way as fine particulate dust that is produced when both raw and tanned leathers are buffed, smoothed, and ground up. Chromium has been linked to increased rates of asthma, bronchitis, polyps of the upper respiratory tract, pharyngitis, and the enlargement of the hilar region and lymph nodes. Additionally, the raw hides are also a breeding ground for anthrax, which can easily make the leap to humans by mixing with aerosolized pollution, though this has been virtually eliminated in the Western tanning industry now that hides are disinfected before being shipped for processing. It doesn't play well with your skin either. Once absorbed through unprotected handling, chromium can cause dry, cracked, and scaled skin; as well as erosive ulcerations that refuse to heal known "chrome holes." And should one become sensitive to Chromium exposure, contact with it will result in swelling and inflammation known as allergic dermatitis. Back in 1980, nobody outside of the tanning industry had any inkling that the work they were doing might be making them sick. In fact, a 1981 study by the International Agency for Research on Cancer (IARC) found no link between the tanning process and nasal cancer in tannery workers. However, over the next few years additional case reports and studies began uncovering a link not just to nasal cancer but bladder and testicular cancer as well, which was associated with the dyes or solvents employed in the finishing process. By the mid 1990s, a number of other forms, including lung and pancreatic cancer—both of which are way down the list of cancers you might survive—were associated with leather dust and tanning. By the start of this century, researchers had uncovered another link between Hexavalent Chromium or Cr(VI) compounds and increased risk of respiratory cancer. Hexavalent Chromium is the +6 oxidation state of the element, a purely manufactured form of the ore that is not found in nature and inherently more unstable than the natural +3 oxidation state. Once common throughout the tanning industry, as well as the automotive industry, Cr(VI) has been labeled as a known human carcinogen by the EPA, the US Department of Health and Human Services (DHHS), the IARC, and the WHO, and has become strictly regulated—verging on outright banning. Germany, in fact, went ahead and actually banned the oxide's use in leather goods, capping contamination at just 3 ppm, back in 2010. And that's a good thing too because, as a number of studies since the 1980s have suggested, Cr(VI) toxicity appears to be an additive process with more severe issues developing and worsening over years of exposure—the same as with lead exposure or cigarette smoking. The problem, as you may have gathered, isn't in the tightly-regulated tanneries in first world-countries—it's in the developing nations that perform the vast majority of the work. Many regions are making efforts to clean up these polluting industries. However, progress is slow. Take Kanpur, India—the self-proclaimed "Leather City of World"—for example. This city once housed more than 10,000 tanneries which, in 2003, were dumping more than 22 tons of effluence into the Ganges river every day. The city took action in 2009, sealing 49 of the highest-polluting tanneries in town—out of a list of 404 heavy polluters. And in impoverished nations like Bangladesh, where this industry generates $600 million in exports each year, the health of workers and the environment are distant afterthoughts. 90 percent of these exports are produced in the Hazaribagh neighborhood of the capital city Dhaka. It was rated as one of the five most toxic, heavily-polluted sites on the entire planet last year by the Blacksmith Institute. Venkatesh, 51, has worked in tanneries all his life, removing hairs from hides in lime pits. His dark-brown arms and hands are dotted with white scars because of a chemical-caused skin disease. '[During] the last four years I have worked no more than ten days per month. If I work more, the itching starts. It is unbearable. The doctor's ointment doesn't help much. But I need to work so my family can live,' Venkatesh says. He earns the equivalent of £1.70 a day at the Saba Tannery and makes ends meet by buying groceries in the local government subsidised shop for poor families. 'Now I always wear gloves, but the lime gets inside of them anyway', he told The Ecologist. Next to Nehru Road, the private clinic of Doctor G. Asokan is busy. 15 patients wait patiently in the waiting room, his garage, for their turn. 'I have between six and eight patients a week from tanneries with skin diseases or asthma. Tanning can also cause allergies, bronchitia and pneumonia. I estimate 40 per cent of tannery workers have health problems because they are in direct contact with the chemicals,' he says. We hear similar statements from other local doctors. So how widespread are such health problems in the Indian tanning industry? It is not easy to find statistics. 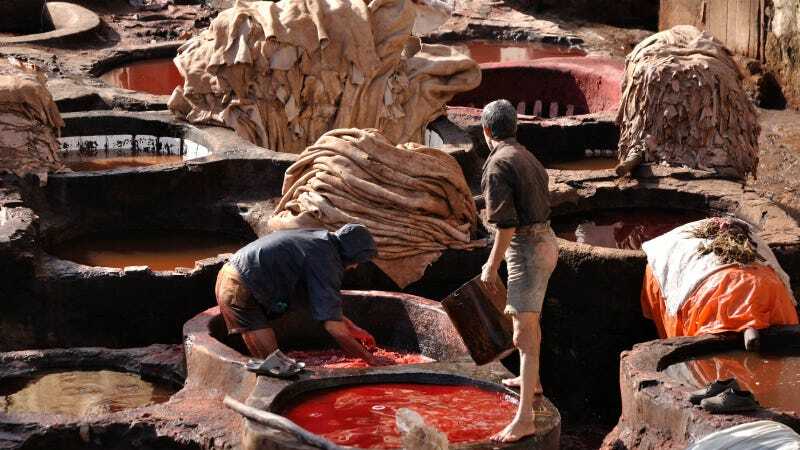 Leather tanning is big business, powerful tanneries have much influence and sensitive research into health problems can cause problems for the industry. "This is a product that is used worldwide for luxury goods, but for these workers who are making them, neither the owners nor the government are looking after our health and safety," Abdul Malek, head of the local Tannery Workers Union, told the Ecologist.